Bad breath can happen to any of us. What we eat, how often we brush, and if we floss all contribute. When we hear “halitosis,” we think of a chronic and persistent issue that even the most flavorful gum can’t hide. Have you ever wondered how using the term “halitosis” came to be, and what the medicine for halitosis is? Bad breath has been around since the beginning of time, but according to the Smithsonian, advertisements for Listerine changed halitosis from a pet peeve to a disgusting medical issue that should receive immediate treatment. Going to market in the 1880s, Listerine was initially intended as a surgical antiseptic. Its creator, Dr. Joseph Lawrence, named his work after Dr. Joseph Lister, the founding father of antiseptics. Advertisements aimed at dentists said that Listerine would kill germs in the mouth. In the 1920’s Dr. Lawrence transferred ownership of the Listerine formula to Jordan Wheat Lambert. First they created the term halitosis by combining the Latin word for breath, “Halitus,” and the medical ending “osis.” The word halitosis started appearing in ads as a medical condition that people should take note of and use Listerine to fight. Who wants to walk around with bad breath? Listerine made sure no one did and positioned itself as the medicine for halitosis. 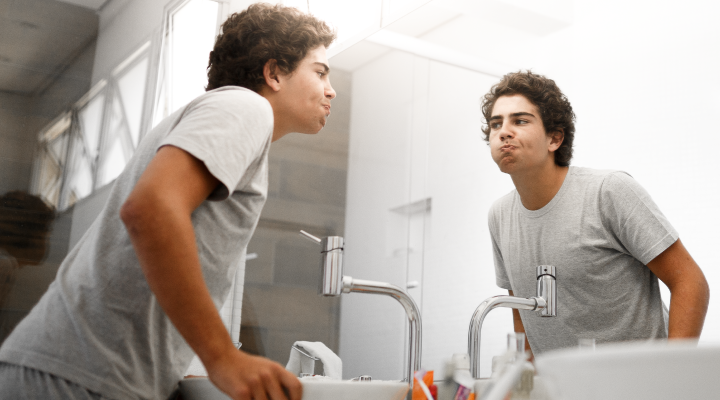 Brush and Floss Twice a Day – Brushing your teeth helps remove smelly foods and stubborn bacteria from your mouth. Flossing plucks food from between your teeth and along your gum line, which can cause bad bacteria to grow and settle in. Brush or Scrape Your Tongue Use your toothbrush to remove plaque, food debris, and dead cells from your tongue’s surface. You can also invest in an inexpensive tool called a tongue scraper. Stop Tobacco Use – If you’re a smoker or a chewer, you’re probably familiar with the negative effects it has on your teeth, mouth, and breath. Eliminating tobacco permanently is good for your overall health and can improve your oral health, too. Go to the Dentist – Visit your dentist twice a year for an exam and cleaning. If you struggle with halitosis, talk to your dentist about other remedies that can help. Don’t have a dentist yet? Find one here today!